Q. How do I request one chapter from a book? If you need just a single chapter from a book, you can request just that chapter rather than requesting the entire book. Sometimes you need just one chapter from a book and don't want to read or use the rest of the book. 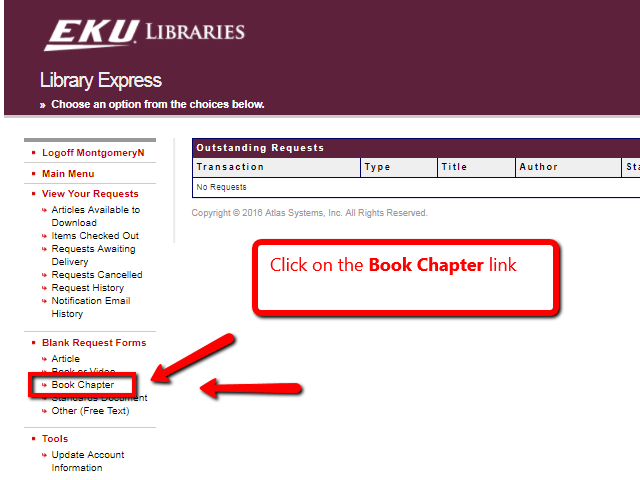 You can request a single -- just one -- chapter for a book using EKU Libraries' Library Express service. Step One: Start at the EKU Libraries homepage and click on the Library Express link. This link is located in two locations on the page. In the center of the page but also in the top, right corner of the page. Step Two: Login to the authentication screen using your EKU username and password. This is the same login and password you use to access Blackboard and your EKU e-mail account. Step Three: On the left side of your Library Express account, you will see a menu of options. Click on the Book Chapter link. 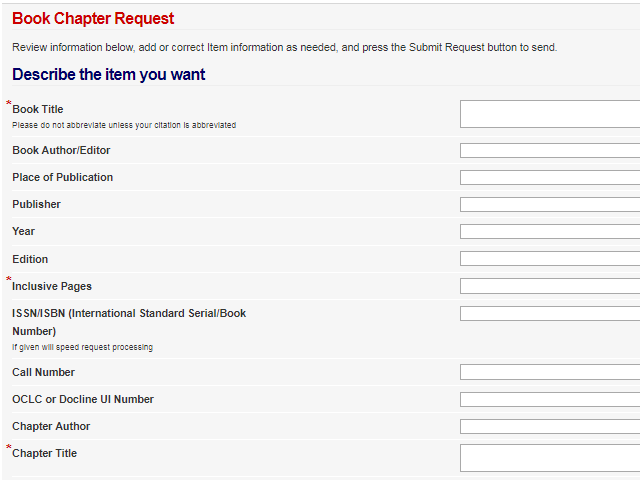 Step Four: Enter information into the form for both the book and specific chapter. Helpful information to enter into the form includes the title of the book, author or authors, publication year, specific chapter title, pages for the specific chapter, and author of the specific chapter if different than the author or authors of the book. Be sure to click the submit request button when done! Step Five: When your book chapter arrives, it will be available by clicking the Articles Available to Download link found at the top of the Library Express menu located on the left of the screen. It will be a PDF document. Tip! Copyright law only allows one chapter per book. If you need more than one chapter from a book, please request the book itself rather than individual chapters. If you have any questions, please contact our Library Express team.